Serene, quiet, one bedroom, Non-Smoking, lakeside condo located on Lake Dillon with unsurpassed views of the Ten Mile Range, Buffalo Mountain, Red Peak and the Marina. Best for 2 people. Dillon offers a 'small town' feel, yet at the same time offers all the amenities of a resort town, both summer and winter. The factory outlet stores of Silverthorne are within walking distance or a short 1 mile drive. In the winter, you are within five to ten miles of four major ski resort areas; Keystone, Breckenridge, Arapahoe Basin, and Copper Mountain and 30 minutes from Vail. There are two Nordic Centers as well. The Summit Stage Shuttle is nearby and provides free transportation to the ski areas and surrounding towns. In the summer, you are on bicycle path connecting Keystone, Frisco, Breckenridge, Copper Mountain, and Vail. There is an amphitheater which offers free concerts, farmer's market, plays and other activities. The Colorado Rockies offer skiing, hiking, biking, fishing, white water rafting and jeeping. Come see what we love about Colorado! Comfortable and well equipped condo. Very comfortable couch, chair and bed. Warm and relaxing place after skiing. Hot tub and underground parking bonus. Thanks, Lisa! I am glad you had a good time. Epic snow! Great location, well appointed condo, comfortable bed, loved everything about it, will return!!! We used Summit Express Shuttle from Denver and there was snow and traffic up the mountain and we got dropped off late at the condo and didn't have any food. So thank you to the prior renters for leaving a box of spaghetti :-) Plenty of spices and olive oil to make a meal. We're paying it forward and left a full box of pasta and pasta sauce. Yes, we rented a car the next morning. EB107 rocked! We are glad you enjoyed your stay! We are always impressed by our guests kindness towards others; the little things make a difference. This was a great unit. The kitchen was very well stocked. Convenient to ski resorts. I bet this would be a great place to stay during the summer. We are happy you enjoyed our piece of paradise! The condo was as described, with a great view of the lake. Condo is on the first floor, with a small flight of stairs. You have to check in and get your key through Summit Resort Group (about 1/2 mile from condo)- super easy with no issues.There is an underground parking garage, but it was too tight for a super cab pick-up truck. No problems parking in front of the condo though.There is a coin operated laundry in the underground garage area (wish it was in the condo). The bed was super comfortable and took up most of the bedroom. Rooms were clean. Great stay, no issues! We’re happy you enjoyed your stay and hope you return! Clean good location, beautiful view from the living room. Owner and management company a pleasure to deal with. Very helpful information binder covering everything you need to know about the condo. Would definitely stay again. Our goal is to have you feel our condo is a home away from home. Thanks for sharing your experience! 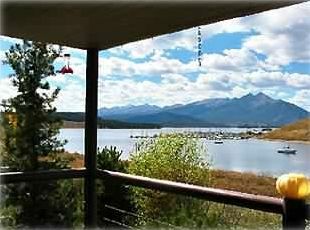 Condo on Lake Dillon near 5 Ski Resort Areas!